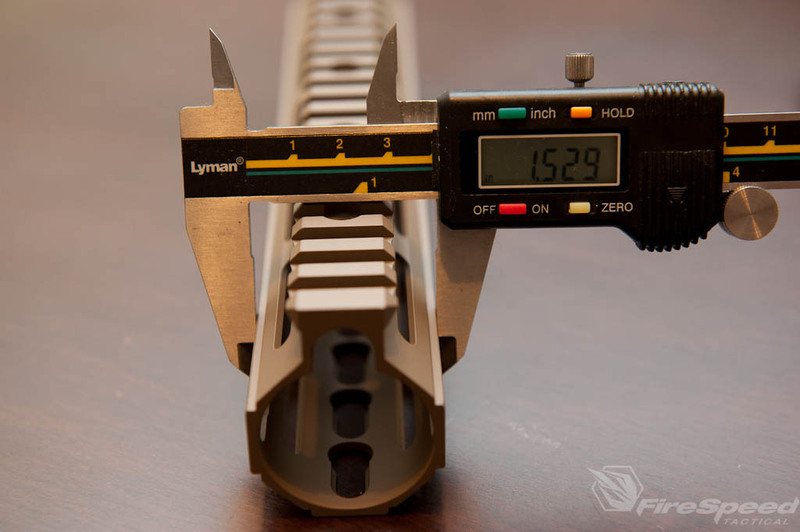 For my AR Pistol build I wanted a light, small handguard. Thankfully customers asked and manufacturers listened so they have been producing some fantastic solutions. 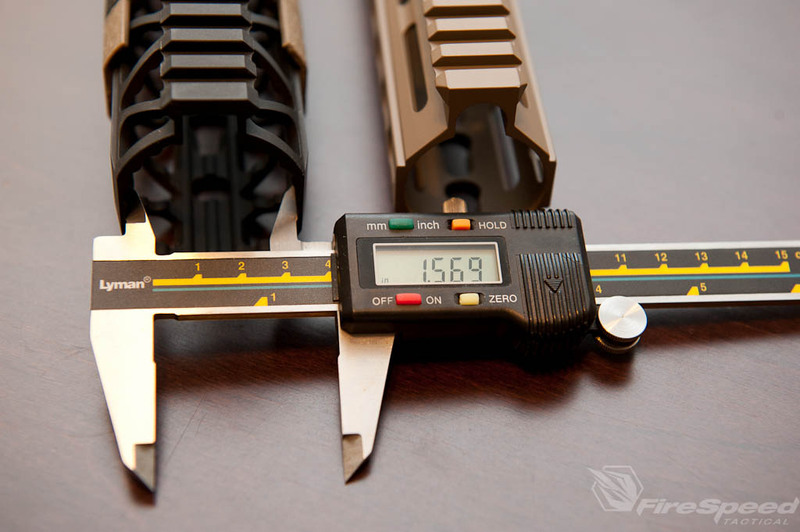 Today we are going to do an over view of two handguards. 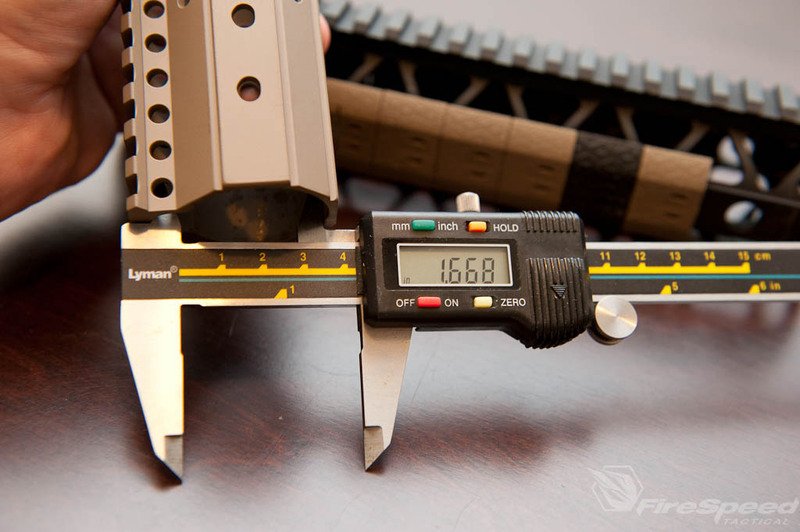 Rainier Arms Force™ Free Float System 9.0 and Parallax Tactical’s PXTreme FFSSR Keymod Free Float Rail 9.2″. 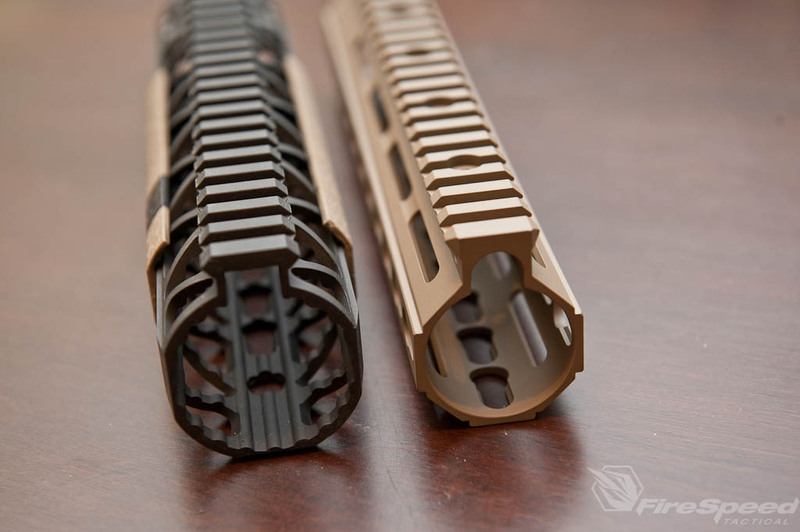 Both are keymod based systems which are an effective way to strip handguards of unnecessary rails that only add weight. 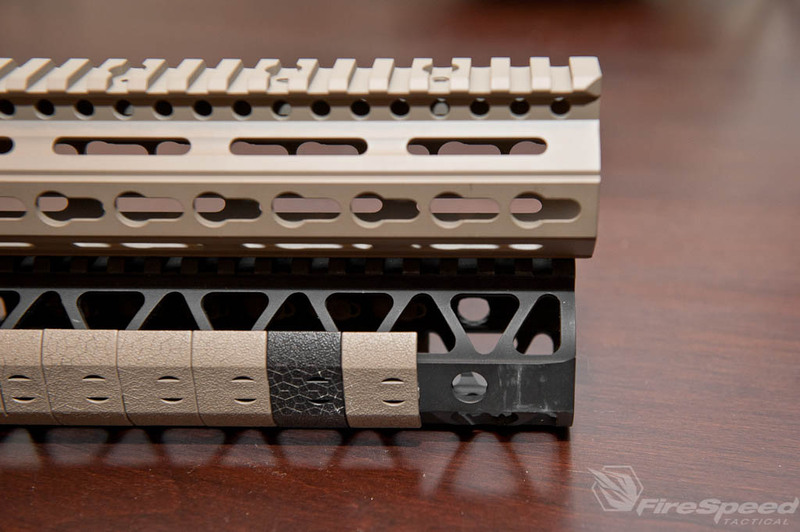 When a user needs to attach an accessory they only need to attach a keymod rail for the desired add on. 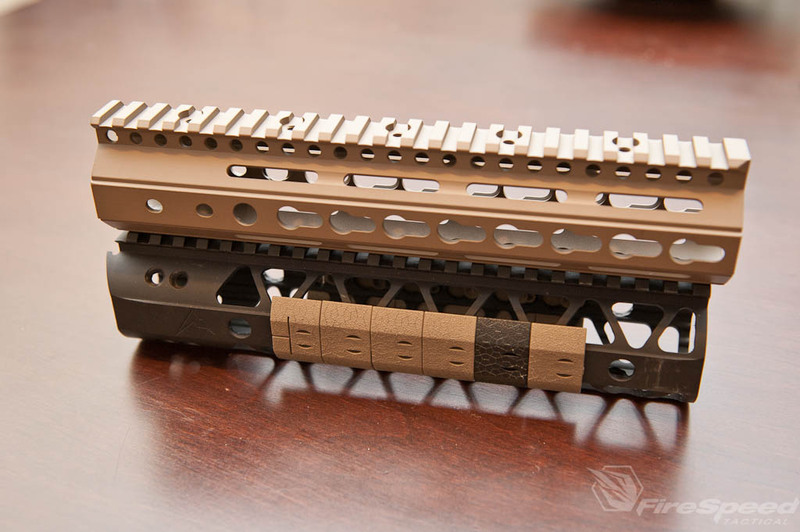 The FFSSR rail I opted for the Cerakoted Magpul FDE version, you can order them in a multitude of colors from Parallax. 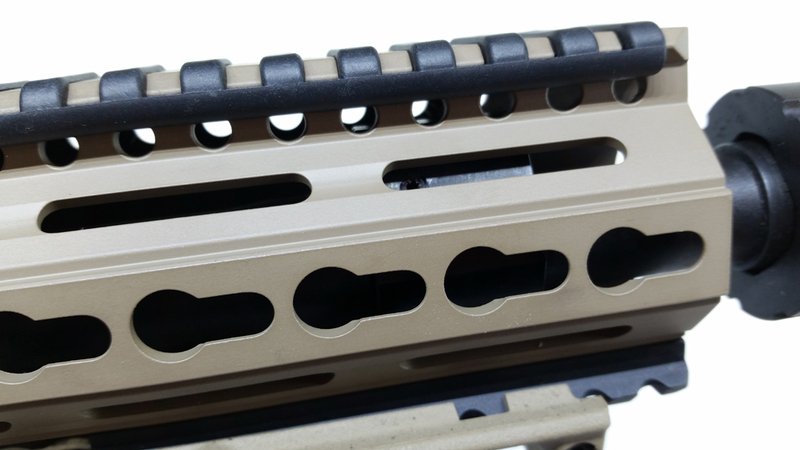 Since I had the Force rail already in use, it has some Noveske NSR covers on it. Technical Specs from Parallax’s website. 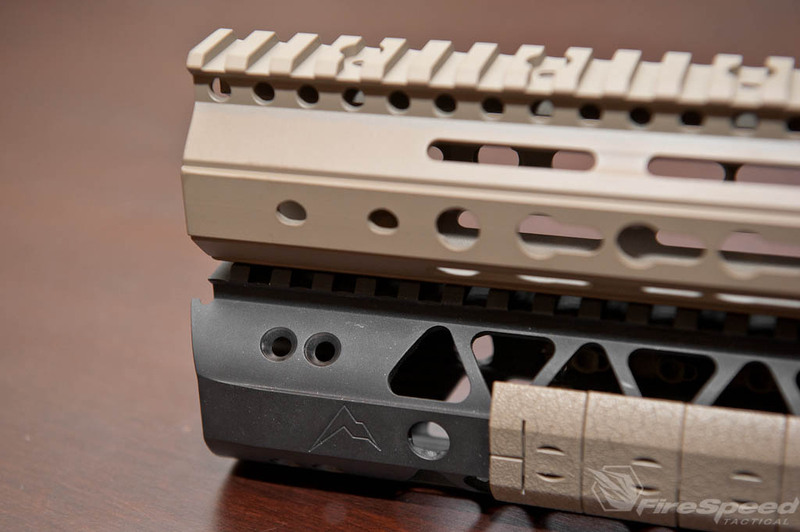 Same slot spacing to take any Magpul MOE rail accessory on the 45 degree slots. 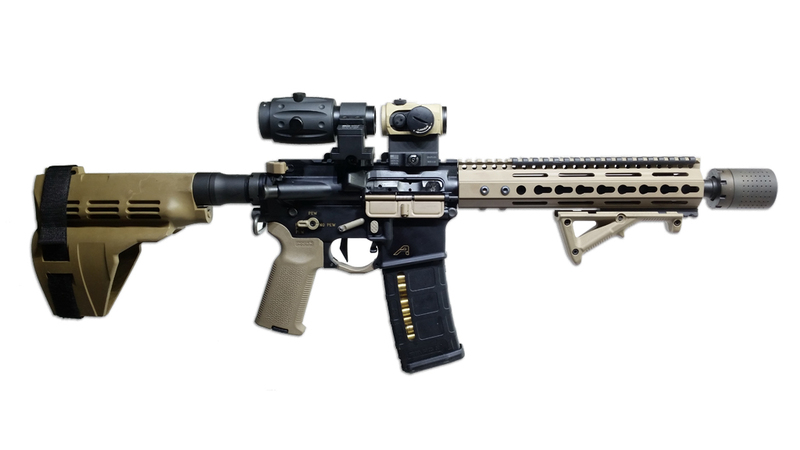 10-32 holes on top rail to mount Sling Studs and future accessories. 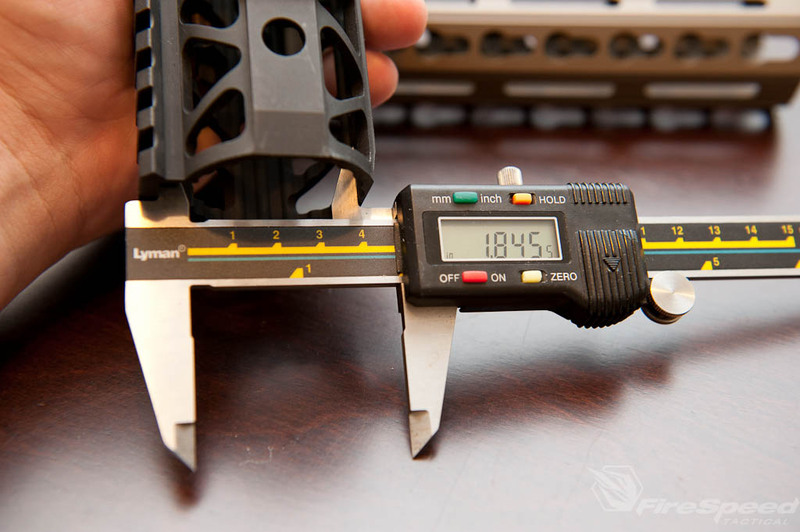 9.2″ Parallax on top and Rainier Arms 9″ on bottom. 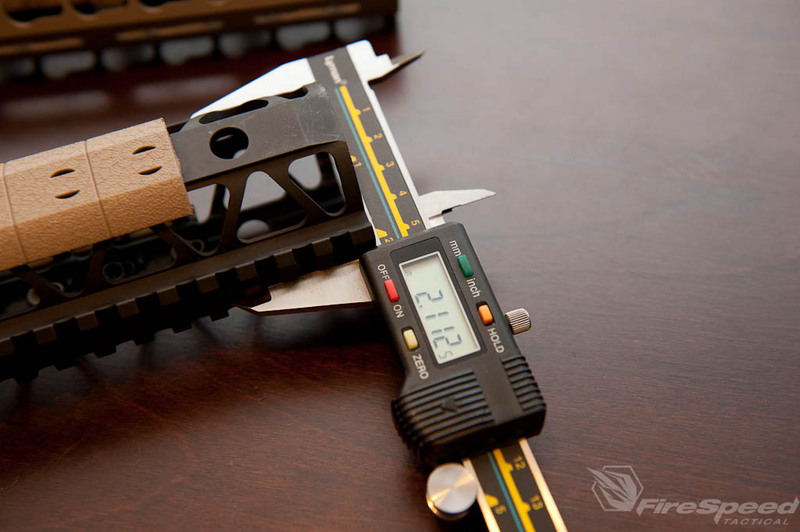 The FFSSR handguard mounts with 6x mounting screws whereas the RainierArms Force utilizes 8 to secure the handguard to the barrel nut. 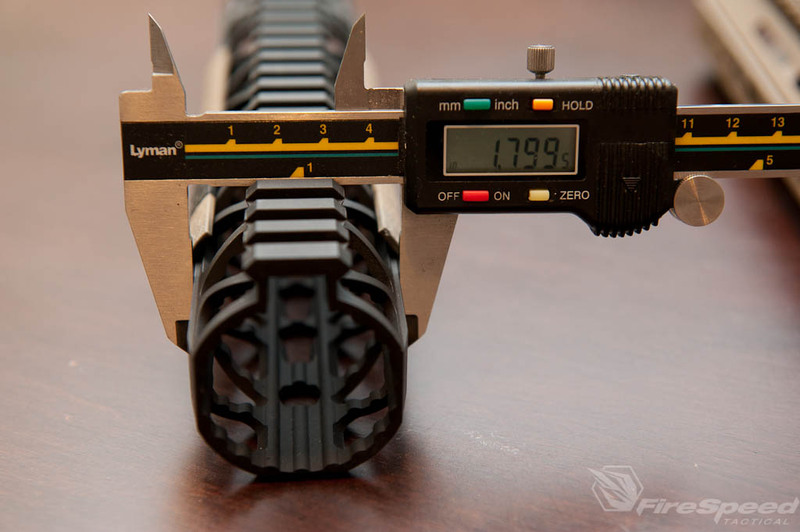 Now on front end of the handguards you have a bit of a difference between the two units. 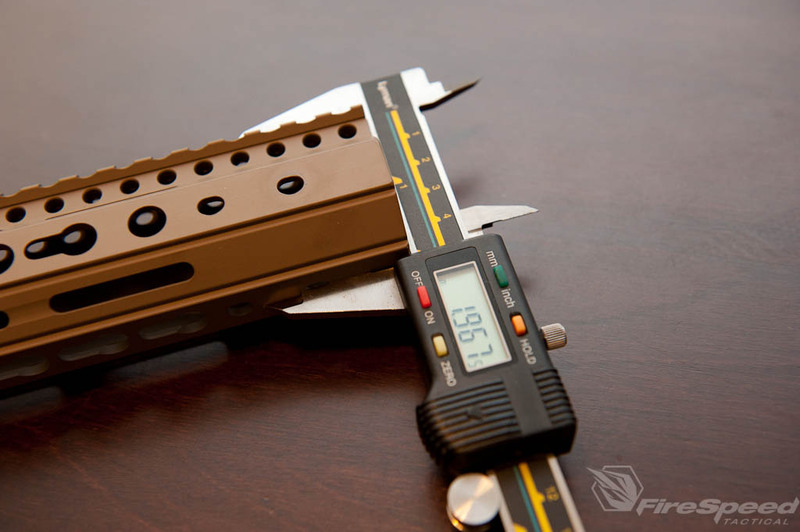 The Force has another QD mounting point on both sides whereas the FFSSR was able to fit in two more keymod slots. Inside Dimension from top to bottom. With the Rainier Force I was able to slide in the allen key for my adjustable gas block but the FFSSR does not have enough room in the opening for me to slide an allen key in. 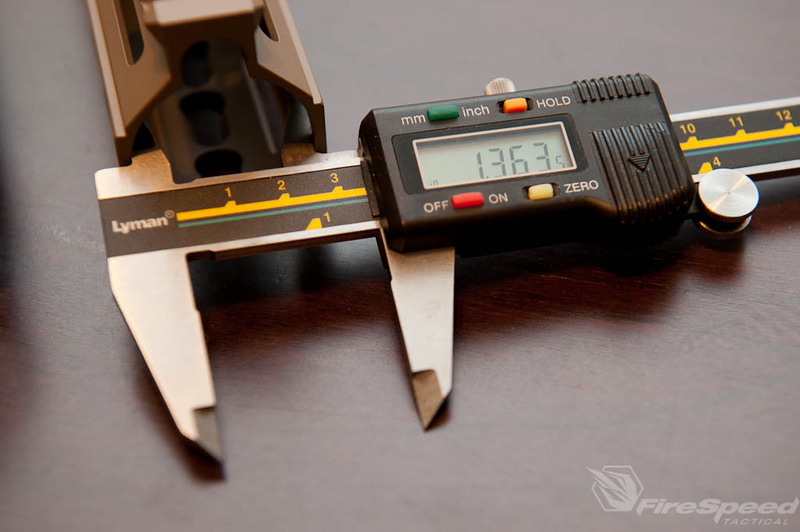 I used both on my 10.5 pistol and love both, but the FFSSR comes out ahead being lighter and smaller so my small hands can get a nice grip around it.